Looking for a dupe of M.A.C Tendertones? 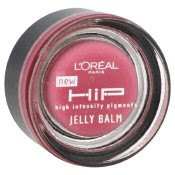 Then you should seriously check out L'Oreal HiP Jelly Balm. This tub of jellylicious goodness contains a mass of lip product that absolutely knocks other lip balms out of the park. The design is very similar to Tendertones. The oversized tub has a black top and a glass bottom, through which you can see the balm. But the similarities end there. While I like Tendertones, I don't think they're quite as balmy as I'd like them to be. Jelly Balm, on the other hand, is absolutely creamy upon the lips. The color is just enough to show up without being overpowering. They feel moisturizing and conditioning, not goopy or sticky -- and they last for hours! My two favorite shades are definitely Savory (a gorgeous peachish-pink) and Plush (the perfect shade of baby pink). But here's my absolute favorite thing about them. They smell and taste exactly like See's Vanilla Lollypops. These lollies are a cult favorite among my family, so finding a lip balm with the taste I crave is good enough for me!